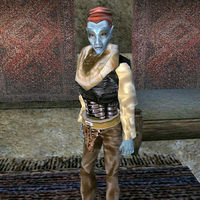 Edryno Arethi is a Dunmer scout and a House Cousin of the House Hlaalu. She can be found at her home, in the southern corridor of the Hlaalu Canton waistworks in Vivec. She is a medium trainer in Athletics, Long Blade and Block for members of House Hlaalu. Edryno wears a boiled netch leather cuirass, netch leather greaves with matching gauntlets and boots, and a common shirt with matching pants. She carries a pair of common shoes along with a steel longsword. Aside from her natural resistance to fire and the sanctuary provided by her ancestors, she knows no spells. This page was last modified on 27 March 2015, at 20:45.